Card inspiration with Danielle Flanders! Have you joined a site called Pinterest yet? Pinterest allows you to pin photos on the web that inspire you. It's just like a pin board where you would keep ideas that spark your interest. I always seem to find something there that invokes an idea for me in scrapbooking, whether it's a technique, or a home decor item, or simply a saying I'd like to try on a card! My first card was inspired by a blue and white beachy pillow I found on-line. The Nantucket die cuts by Pink Paislee were perfect! I layered a few of these on white embossed cardstock, along with a piece of Nantucket ribbon, punched butterflies from the 6x6 Nantucket paper pad and a Vintage Vogue wooden spool, also by Pink Paislee. To create the card, I cut a long piece of white cardstock about and folded the 2 long ends in towards each other, overlapped them in the front and adhered, then stitched along the edges. I punched a hole at the top with a 2" circle punch for inserting money or a gift card for the sweet birthday girl. I added a stamped sentiment by Papertrey Ink from their Mega Mixed Messages stamp set. The next card was inspired by these frames I saw online. Loved the little weathered strips, so I decided to cut my 6x6 Nantucket papers into strips and randomly sew them together. I didn't want them to be straight. I think it adds to the casual "beachy" feel. Two Nantucket die cuts were added over the top and two wooden pieces from the Nantucket Wood Shapes! Thank you for viewing my projects today! I hope they leave you inspired to try something new on a card! 30 days until Crop & Create Saskatoon! Have you registered? Core'dinations and embossing folders...oh my! Good morning! I am excited to share a technique with you all today but a little sad that it happens to be fall related. This summer has flown by and, given the fact that I am a teacher and returning to work in one week’s time, I am sad to bid this warm weather adieu. During my holidays I spent some time organizing my craft room and discovered I have a lot of embossing folders and texture plates. I don’t discriminate either – Sizzix, Cuttlebug, Fiskars, Stampin’ Up! - I treasure them all. This got me thinking about how I could try and use as many as possible in one project. I was also inspired by the new Kraft-Core Cardstock by Core’dinations which is arriving in stores now! Supplies: Core’dinations cardstock and Sand-It Gadget tool, Sizzix, Cuttlebug and Stampin’ Up! embossing folders, Quickutz letter dies, Sizzix and Spellbinders leaf dies, We R’ Memory Keepers Crop-a-Dile (holes), Jillibean Soup twine, American Crafts layering tape, Xyron Creatopia (to add adhesive to the leaves), Font: Mason, other: sewing machine and thread. NOTE: This is a 6” x 6” layout. Each embossing folder and texture plate offers up a unique way of adding dimension to your diecut shapes whether they be leaves, flowers, hearts, stars or other. For this project I used both Sizzix and Spellbinders leaf dies. I used my Big Shot embossing machine to cut a variety of shapes and colours from the Kraft-Core cardstock. I rooted through my embossing folders for the ones that would add unique veins and dimension. For example, spider web embossing folders provide a perfect vein-like formation to leaves. Next, lightly sand the Kraft-Core cardstock (or other Core’dinations cardstock) to reveal the unique core. This adds even more dimension to your embossing. As one final bid farewell to summer, here is a layout that I made of my brother-in-law kayaking near Perth, Ontario. I used 36 different embossing folders, texture plates and embossing dies to create the flowers. This is a 12” x 12” layout while the “Fall” layout above is a 6” x 6” layout. Supplies: Core'dinations cardstock (Kraft-Core) and Sand-It Gadget tool, Cuttlebug embossing folders, Sizzix embossing folders and flower dies, Stampin' Up! embossing folders and buttons Embosslit, Quickutz embossing folders and letter dies, American Crafts layering tape, Font: Mason, other: sewing machine and thread. Enjoy these last few weeks of summer...or winter if you happen to hang your hat down under. I am looking forward to seeing many of you in October at ScrapFest in Oshawa, ON, and CreativFestival in Toronto, ON. Shape punches challenge with Danielle Flanders! Good morning and welcome to a new week! We are excited to have the very talented Danielle Flanders on the blog this week. We have been long time fans of Danielle's and looking at the artwork she has to share this week, if you don't know Danielle's work, you are sure to love her too! "When I received the new Nantucket line by Pink Paislee, I couldn’t wait to “dive” right in (no pun intented!) and scrap some photos of my daughter collecting shells from our trip to the ocean in Maine this summer! I wanted to create extra movement to the page to reinforce the water theme, so I decided to add some swirls with the Cuttlebug embossing machine. I love how the swirls look like little waves on the layout. To do this, I first punched four white cardstock circles with a 2″ circle punch by Fiskars. Next, I placed the punched circles inside the swirly embossing folder and ran them through the machine. This is such a simple technique, and the swirls add to the theme of the layout without taking attention away from the photos! I added a die cut sun shape from the Nantucket – Ephemera package by Pink Paislee over the top of one of the circles, along with some Nantucket Wood Shapes. I wanted to keep the wood color of the shapes, because it reminded me of driftwood found on the beach. But of course, these could have been painted or misted as well. Here you can see I added some twine around the ribbon for and added texture and beachy feel. I cut the blue paper around the wave shape to add even more movement to the page. So my challenge for you today is to put your shape punches to good use again! Punch out some shapes and then dry emboss them to add a fun detail. Then use them on a card or layout! Have fun! Are you joining us for Crop & Create in Saskatoon? More details here! 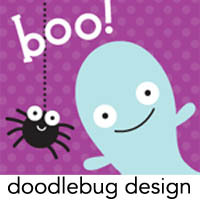 A Doodlebug giveaway...what could be better?! 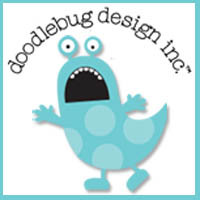 We are also excited to tell you about some other things about doodlebug. First, they have a BLOG! Now you can keep up-to-date on all things going on with doodlebug including some really beautiful projects featured. And, they have also launched a design team call which you can learn more about here. Doodlebug has been very busy indeed! So be sure to leave a comment below to win the new doodle twine collection before 6:00 pm. on Thursday, September 1st. Then jump over to their facebook page for another chance. Good luck! Congratulations Cherie! Send us your address to ideas@scrapbookandcards.com with "picture keeper winner" in the your reference line. Have a wonderful weekend everyone! Don't forget Project 12 layouts are due by the 28th! Come and join us this fall...and a VIP pass giveaway! There is still space available to join us on the first ever Crop & Create event being held at the beautiful Sheraton Hotel in downtown Saskatoon!!! For only $159 you have 21 hours of glorious cropping time, the opportunity to take classes from world renowned designers Becky Fleck, Kelly Goree, Kimber McGray and Vicki Boutin, a "swag bag" this is very fun (and full! ), not to mention great food (did I mention chocolate? ), challenges, make n' takes, time with the experts and more! We have many coming from areas around Saskatoon but also Alberta, Manitoba and Ontario too! Register today to reserve your space at this premier event! And, help us spread the word and win too ~ click here for details. Yes friends ScrapFest is here again and registration opened last night! We are thrilled to have Becky Fleck, design team members Sarah Hodgkinson and Vicki Boutin teaching some fabulous classes this year and so far we have 12 different make n' takes lined up just for you! Be sure to join us in the booth for our New Product Showcase, prizes and more! If you plan to attend ScrapFest, tickets go very fast so click here to register! But if you would like to win a pair of VIP passes, leave us a comment below before Thursday, September 1st at 6:00 p.m.! Calling all papercrafters, quilters, sewers, beaders and more! Creativ Festival is the largest gathering of all crafts under one roof and is located at the Metro Toronto Convention Centre at the base of the CN Tower! Discover, learn, try and buy everything you need to be creative! Becky Fleck and Sarah Hodgkinson are not only teaching classes but they have come together to teach an amazing mini album class. We will have the Interactive Studio filled with make n' takes, demos, lectures and more! When you register for this event, but sure to use promo code 300SC to receive $1 off! We look forward to seeing as many of you as possible this fall! Now back to your beautiful summer day! Tie-dyeing paper technique with Becky Fleck! When I went to church camp every summer as a kid, one of my favourite activities was making tie-dye t-shirts. I would create all kinds of elaborate, crazy patterns and mix the dyes together to create new colours. I couldn’t wait to cut the rubber bands and wash and rinse my t-shirt to see how it turned out! There are so many crafts that cross over into scrapbooking and I recently thought to myself, “Why not give tie-dyeing a try?” To get started, you’ll need a variety of spray ink colours, dictionary paper (or any other type of light-weight paper such as sheet music, newsprint, etc.) and old newspapers. Spread out a few newspapers to protect your work surface. [Note: for this project, plastic spray mats are not an ideal work surface.] Crumple a sheet of dictionary paper into a ball. Choose two spray ink colours that, when blended together, create a third colour. For instance, yellow and red blend to orange. Spray on several small, random patches of the first colour, rotating the ball around on the newspaper. You’ll want to hold the nozzle about 2” away from the ball and spray in short, fast bursts. The ball will begin to expand and open as the paper saturates with ink. Once dry, gently open the ball and hand press the paper flat. Now that you see the random pattern and ink coverage this technique creates, you’ll get a better idea of how much (or how little) ink to spray onto the ball, and how large to make the patches of colour. Try another one! From the two I made, I created three paper blossoms for this card that I showed on Monday. You could also use this tie-dye technique for backgrounds, paper piecing, die cuts and envelopes. Give it a try and share your results with us—we’d love to see what you come up with!